When Lu Yu uses heart peaches and club wines, the effect is doubled. Once per turn, Lu Yu can look at one player's hand. He can then take any number of clubs from that hand. Lu Yu must show everyone what he takes. Lu Yu can discard a club and a peach or a wine. This can heal up to three people one each. When Lu Yu uses a club Wine for either purpose the effect is doubled. 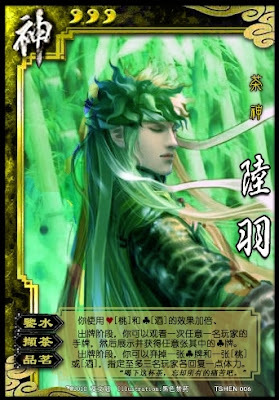 Lu Yu can use "Taste the Tea" as often as he likes during his turn.